Two months ago, it was Liverpool’s 3-1 win over their great North West rivals that spelt the end for Jose Mourinho. Six odd weeks later, the Red Devils appear to be in the form of their lives under new manager Ole Gunnar Solksjaer, with players like Paul Pogba and Marcus Rashford again looking like world beaters. Mourinho had once said it would need “a miracle” for United to finish top four- Solskjaer has already achieved the seemingly impossible. Liverpool are level on points with Man City (who further improved their goal difference with a 6-0 thrashing of Chelsea over the weekend! ), but have a game in hand. It’s not as comfortable for the Reds as it was around New Year’s eve, but they still have their destiny in their own hands as they seek to win their first ever Premier League title. Liverpool’s last league title came in the 1989-90 season, when they won the Old First Division. The 80’s were a period of great success for the Reds domestically- they won the top flight title six times in that decade. 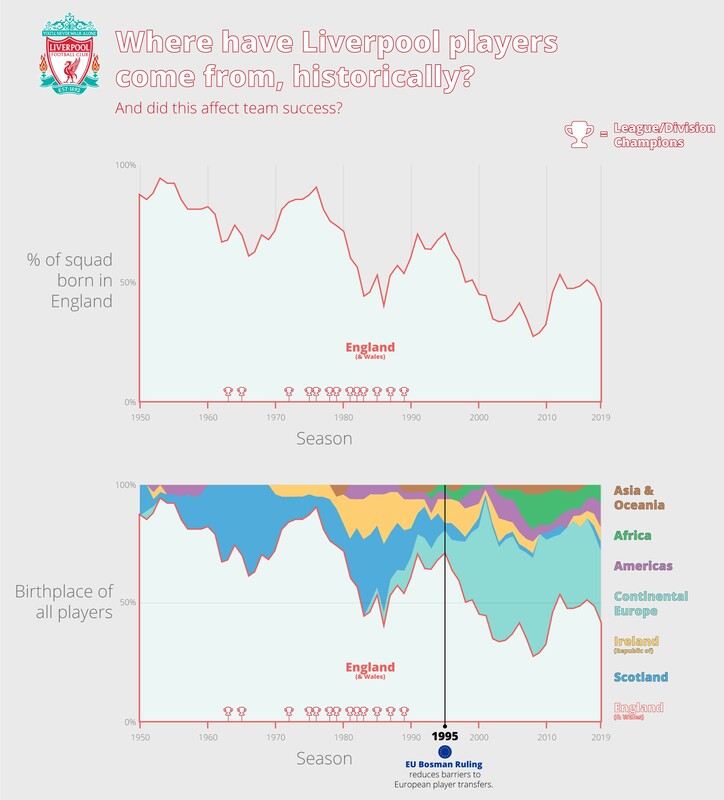 We came across this fantastic piece of data, curated by Casumo, that shows the birthplace of players at the club since the end of the Second World War till date. In the 80’s, the Liverpool squad, as you might expect, was dominated by players from the United Kingdom and Ireland. There were hardly any players from continental Europe and Africa. However there is a marked increase in the number of players from the continent after the passing of the Bosman rule. The continental influence is at its peak in that period from the late 90’s till 2010. That of course is the period when the club had two managers from the same region, in the form of Gerrard Houllier (France) and Rafa Benitez (Spain). The number of English born players in the squad is at its lowest in the Benitez era (well below 50%), as can be seen below. Post Benitez, when the club had Roy Hodgson, Kenny Dalglish and Brendan Rodgers managing in the early part of the current decade, the figure moves back above the half way mark. Makes for fascinating reading!